Manglik defect (Dosh) is emphasized in Hindu while matching the horoscope of boys and girls. When we get to know that boy or girl is Manglik then this creates worry. At this time, people makes fake horoscope of his boy or girl due to fear. This Manglik defect causes delay in the marriage of boy or girl because Manglik boys or girls are less liked. The truth is that we should consider this defect in marital happiness. This defect alone cannot make anyone happy or sad. Many times it is seen that those who are not Manglik, they are also not living a happy life. So we should see other planets also while considering this Manglik defect. If a person having Manglik Dosh in his horoscope then he gets afraid while Mars does not harm anyone. We should not fear from Mars because there are other planets also like Sun, Saturn, Rahu and Ketu which affect us. Well, we all are Manglik but partially. All the planets are important to us for our life and body like that Mars is also plays a important role in our like. Mars gives us courage, power and vigor. So that, we can do our work and live a happy life. If Mars is at first (lagna), fourth, seventh, eighth and twelfth house in any person horoscope then that person should be considered as Manglik. However, we should see Lagna Kundli, Chandra Kundli and Shukra Kundli for verification of complete Manglik. If any person is Manglik as per Lagna Kundli, Chandra Kundli and Shukra Kundli then he is complete Manglik. 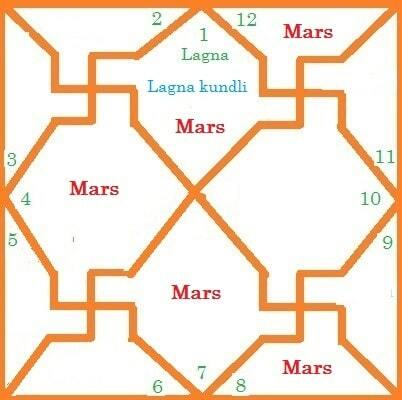 If Mars is at first (lagna), fourth, seventh, eighth and twelfth house in Lagna Kundli then that Kundli is Manglik as shown in the below image. This type of Kundli is Manglik from Lagna itself. It affects our body and that person is aggressive and stubborn by nature. Note: Thus having Manglik in all three Kundli, complete Manglik Yoga(Dosh) is created. Many people also say that this effect ends after 28 years but in reality there is no such rule. This Dosh ends after marriage. Below are few reasons we should consider when Mars is at first (lagna), fourth, seventh, eighth and twelfth house in our horoscope. First (Lagna) house in horoscope is of our nature. If Mars is at first house then that person is clever. He is angry by nature and like fighting. Fourth house in horoscope is of happiness. If Mars is at fourth house then it affects our happiness in life. We face tension due to our parents, society and by other people. Because the factors of this house are happiness, mother, vehicle, home and society. Seventh house in horoscope is of our spouse. If Mars is at this house then it affects our spouse nature. It makes spouse nature stubborn and grumpy. Due to this, quarrel happens even on small things. It also affects our earnings and family. Eighth house in horoscope is of barriers, age, sin and our Laws. If Mars is at this house then we face many problems in our life and quarrel happens between our family and spouse family. This position of mars is not considered good. Twelfth house in horoscope is of expenditure, prison, foreign passage, sleep, enjoyment, feet and left eye. If Mars is at this house then it affects these things. 1 : By doing marriage of Manglik girl with Manglik boy then this ends Manglik Dosh and they live a happy married life. 2 : If Sun, Mars, Saturn and Rahu in boy horoscope is at the same house at which Mars is placed in girl horoscope then this Dosh ends. 3 : If Mars is at first (lagna), fourth, seventh, eighth and twelfth house in horoscope in his own Rashi Aries and Scorpio or in his best Rashi Capricorn then this dosh ends. 4 : If Jupiter or Venus is at first (Lagna) house in strong position and Mars is weak or in his enemy house then this dosh ends. 5 : If anyone in boy or girl is Manglik and Saturn is at same house in other horoscope then this dosh ends and marriage is good. 6 : If Mars is on the vision of Jupiter, Rahu is in central location and a yoga is created between Rahu-Mars at central location then this dosh ends. 7 : While considering Manglik dosh in our horoscope then we should also see moving(chalit) Kundli. 8 : If Mars is at first house in Aries Lagna(first house), fourth house in Scorpio Lagna, seventh house in Taurus Lagna, eighth house in Aquarius Lagna and at twelfth house in Sagittarius Lagna then this dosh ends. 9 : When Venus or owner of seventh house is in strong position in boy or girl horoscope and vision of any good planet is at seventh house then effect of this dosh becomes weak. Note : Many times it is seen that people get marriage with same Manglik horoscope then this dosh ends but if Mars is at first house in both horoscope then this will create problems in married life. Same Manglik Yoga is harmful because Mars and Rahu like quarrel. Mahamrityunjaya Mantra chanting around one lakh and 25 thousands. Note : When considering Manglik Dosh we should also see bride and groom horoscope.